This surname, which is associated with the world famous toy store in London, England, is locational. 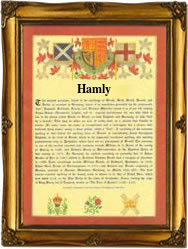 Recorded as Hamley, Hamly, and Hambly, it originates from a place called Hamley in the county of Staffordshire. Derived from the pre 7th century Olde English language, the name probably means the house (ham) by the fenced enclosure (leah), although other explanations are possible. Medieval locational surnames were usually "from" names. That is to say names that were given to people after they left their original homes and moved somewhere else. The easiest form of identification for these "strangers" was to call them by the name of the place from whence they came. In this case the surname is an early recoding in the surviving church registers of Staffordshire with Mary Hamley marrying William Hamlen, at Mucklestone, on September 24th 1563, whilst Peter Hambly married Agnes Jenkinson at St Georges Chapel, Hanover Square, Westminster on July 1st 1737.